While in New York, I had the opportunity to meet with Eric LoPresti in his studio in Brooklyn. I took some photos and talked with him about his upcoming show, "Different Country", running April 8th - May 8th 2011. The opening reception is at Like the Spice gallery on Friday, April 8th from 6:30-9:00pm. Eric was a guest on this blog back in 2009 - you can read that post here. He was also featured in the part of "Natural Causes" that I curated at Rule gallery last year. Eric sketching out some of the graphic lines on a recent work with black tape - to be drawn in with black ink for the finished work. Rattlesnake (with Vectors), Oil and India ink on linen, 2011. 40" x 60"
Graphite and India ink on paper, 2011. 11" x 14" - this drawing will be a part of the new exhibition. Halo (Nez Perce), Oil on linen, 2011. 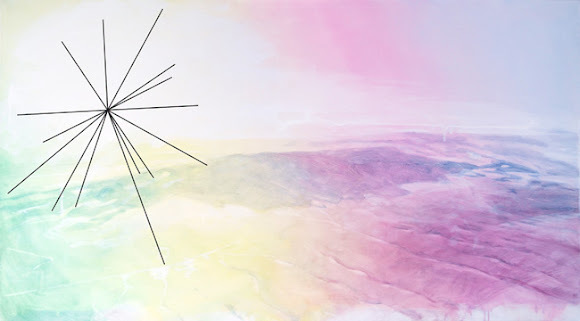 60" x 40"
From Like the Spice blog, "In his newest body of work, Eric creates beautiful American landscapes in his oil paintings and graphite drawings with; they feature soft hues and color gradients that outline test sites, wastelands, and wide open spaces. 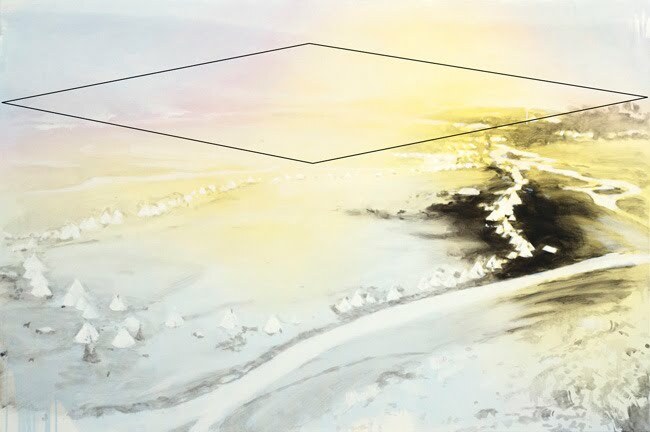 'Maintaining his established focus on the physical and psychological aftermath of the Cold War, LoPresti renders landscapes bearing the scars of nuclear testing and subsequent environmental clean-up campaigns, especially those near where he grew up, in the desert steppe of eastern Washington state, near the Hanford plutonium production site.' His third solo show here at Like the Spice, in "Different Country," Eric pairs spectral color gradients with dark linear elements suggesting a division of territory within each work." Some of the things you'll find at "minutiae"
Mention in April Art Forum!